Poco F1 is packed with flagship-like configs under a very compelling price tag. The underlying software is however being continuously criticised for lack of optimizations. Xiaomi promised to fix the issues with future software updates. Features like hiding the notch or screen recording with internal audio were added in subsequent updates. While problems like missing Widevine L1 certification are still at large, a large portion of Poco users are primarily getting frustrated with the touch issues. The phone can not handle multiple touches which is essential for mobile gamers such as PUBG players. Moreover, huge latency and hiccups while scrolling are common symptoms. Xiaomi usually pushes the fixes on beta branch of MIUI first. After the closed and open beta participants mark the changes as satisfactory, they are being ported to stable channel. With the help of Xiaomi Firmware Updater, we were notified about the 9.1.24 Global Beta build for Pocophone F1 on 25th January. This update features major touch related fixes. Apparently the fixes really work to solve the glitches. Beta users reported huge improvement in touch performances. The latency was reportedly minimized too. After updating from 9.1.18 over to 9.1.24 all my touchscreen problems are now completely gone. That means ghost touches, edge delay, wrong button presses etc. Good job and thanks for the update! The touch is perfect now… scrowling, pubg, edges of the screen and ETC… Good job to all dev. 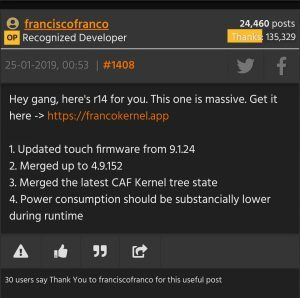 The updated touch firmware was also integrated with Franco’s custom kernel for Poco F1 since r14. Alvin Tse, global head of Pocophone, was aware of the situation and thanked the developer team as well as users for giving feedbacks. Following the regular drill, the fix got greenlight to be integrated with the upcoming monthly Global Stable update, commonly referred as February update. But the development was delayed due to the holidays for Chinese new year. Xiaomi announced on their forums about the delays. We’re having Chinese New Year holiday soon, accordingly there will be an adjustment in the schedule for the MIUI 10 Global Beta ROM public release plan from 28th January 2019 to 10th February 2019. The developer team of Poco F1 also skipped the regular feedback for one week. Now it seems that the stable update may need more testing and will not be possible to deliver before March. Users who already unlocked the bootloader of their Poco F1 can try FrancoKernel on the existing January build (MIUI V10.2.2.0.PEJMIXM) to experiment. Xiaomi uses state owned China Telecom A-GPS provider, but why?